If you've been looking into getting a trampoline for your family, you've probably read a lot already about trampoline safety. If not, I strongly suggest you look into this topic because it's very important to make sure you protect against potential injuries. A lot of people, including manufacturers, advise avoiding setting up your trampoline on sloped ground. Sometimes this just isn't an option though and if your yard just doesn't have enough level ground to set your trampoline up on, you may be left wondering if it's even a good idea to get one. Fortunately, there are still ways you can safely do this, so let's take a quick look at how to set up a trampoline on a slope. Try to get the trampoline as level as you can. It doesn't have to be perfect, but it must look level. There are a number of ways this can be done and some are more expensive than others, but no matter what method you choose, you're going to have to put some effort in to make sure your trampoline is as safe as possible. The method you choose to level your trampoline service will depend largely on how uneven the area you plan to place it in is. It's best to find a place as even as possible to start with because this will reduce the amount of time, effort, and money required to reach your desired end result. 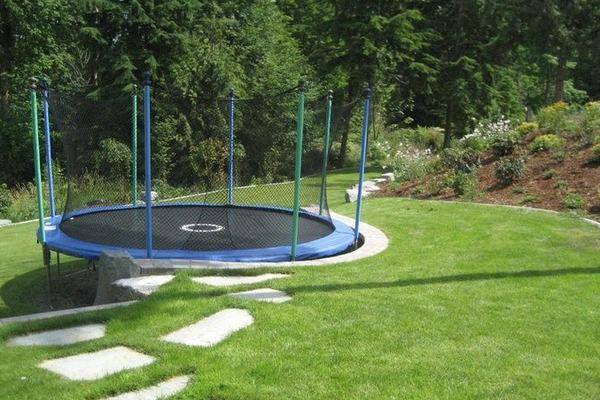 Place your trampoline in the area you'd like it to be. Place a flat plank across the middle of the trampoline. ​You'll need a plank that's longer than the width of the trampoline to make sure it goes all the way across. ​On the down-slope side of the trampoline, place a carpenter's level at the end of the plank. What you're looking for here is exactly how much slope needs to be corrected for you to safely use your trampoline. You're going to divide the diameter (in inches) of your trampoline by the number of inches you had to raise the plank to get it to read even. If the result is greater than seven inches, it's probably not a good idea to proceed. 1 - Dig a trench to lower the legs on the up-slope side of the trampoline. More work, but requires less money. All you really need is a good shovel. 2 - Add soil to the down-slope side of the trampoline until the legs on this side are even with the legs on the up-slope side. Slightly less work, but can cost a bit more money. Can be a more permanent and trust-worthy solution, but you'll want to make sure the ground is packed really well when you're done. 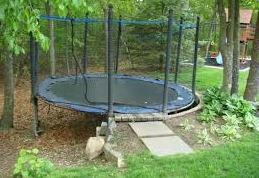 Another option would be to cut the trampoline legs. Just remember that steel is hard. Make sure you have a proper saw for the job. If the level of the slope that needs to be corrected is less than four inches, you're not dealing with a very severe slope. It's still important to get your trampoline as level as possible before using it though. In this case, you may want to consider using a leveling kit or leveling blocks, although digging a trench on the up-slope side or adding soil to the down-slope side will work here as well. There is really no "best way" to do this because every situation is unique. The best advice I can give in this area is to measure the slope using the method described above and proceed accordingly. If you're dealing with ground that isn't necessarily on a steady slope but has dips and curves in it, there are a couple of really simple options to help you get your trampoline set up on an even surface. 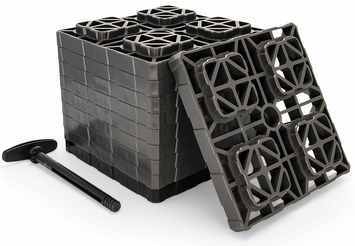 Depending on exactly how uneven the ground in your yard is, you can either use a leveling kit or leveling blocks. Both of these are relatively inexpensive, so there's not really a right or wrong answer here. Leveling kits aren't really at all as complicated as they sound. Basically what you're looking at here is a set of clamps that will attach to the bottom of the legs on your trampoline's frame. 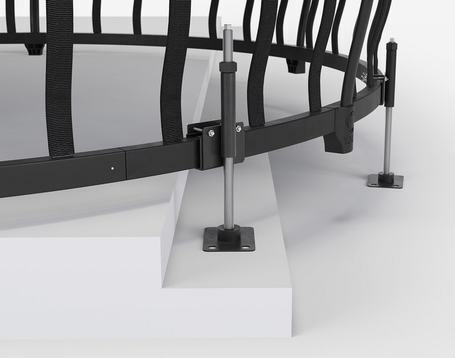 These clamps have adjustable feet that can extend and retract where necessary to make up for the difference in the ground level around the edges of the frame. If this is the route you choose, my only suggestion is to make sure you get a kit made out of high-quality material such as heavy gauge steel. Also, if the level variance in your ground is too great, you may want to consider using leveling blocks instead. The feet on these kits can only extend so far. Don't just use cinder blocks, bricks, or landscaping stones. ​They're stackable so you can safely make up for more level variance without worrying about stacked blocks slipping away from each other. 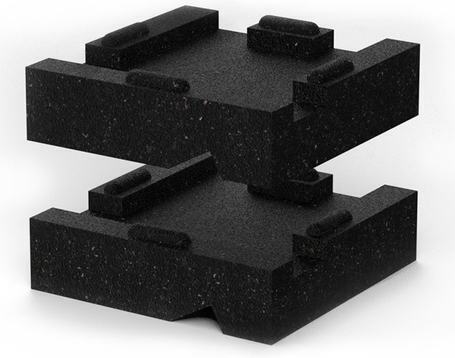 ​They're light-weight but extremely durable. They have grooves build in to keep the legs of your trampoline from shifting. Hopefully, you're feeling a bit better now about setting up your trampoline on sloped ground. This is totally doable and, while we've only discussed a few points on how to set up a trampoline on a slope, at least now you know you (probably) don't have to return yours just yet. No matter what though, safety should always be your main concern. If you don't feel like you can safely level your trampoline by yourself, don't hesitate to ask a friend for help or contact an expert.